Do you struggle with computers graphics, fixing customer’s bad artwork, working with just an idea, creating color separations that work at press, doing high-end photo realistic color separations for light and dark shirts, whether to use Illustrator, Corel Draw or Photoshop – and more? Then this class is for you! 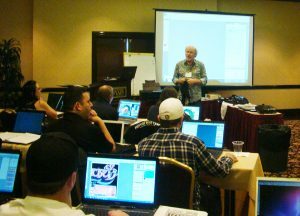 Taught by the industry’s leading computer and color separation expert, Scott Fresener, this hands-on class is an intense two days of how to use vector programs like Illustrator and Corel and how to use the magic of Adobe Photoshop to create and color separate images for garment screen printing. In this class you will learn the secrets of taking good and bad artwork and making great separations for light and dark shirts to produce prints that will jump off the garment! 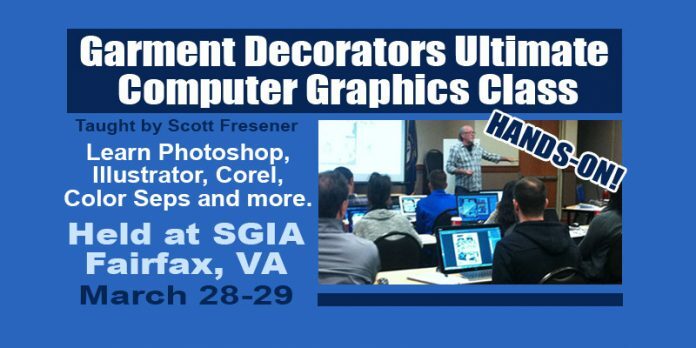 This class covers the entire process including vector separations (Adobe Illustrator or Corel Draw) and how to do simple and high-end separations in Adobe Photoshop. Whether you are a beginner or experienced printer there is something in this class for you. Register here for this workshop AND Totally T-Shirts! Garment Screen Printing: Basic to Advanced Workshop! A good tutorial on Adobe Photoshop to get you up to speed on how it works. We assume some attendees will have a basic grasp of computer graphics but maybe not Photoshop. Basic and advanced techniques with vector programs like Illustrator and Corel Draw. How to trap and choke colors for better printing. How to build images in vector programs. How to build images in Layers in Photoshop. How to reduce the color count to accommodate your printing press. How to color separate in Adobe Photoshop including Simulated Process color and CMYK. How to fix bad JPG images. How to get cleaner colors with less color mixing. How to soft proof the image and see exactly how it will print. How to make the seps very screen print friendly with proper ink densities. How to create separations that work on all shirt colors. How to design artwork with color separations in mind. How to design and separate so your production people will love you. How to quickly fix customer artwork and improve the color contrasts and brightness. What type of separations to use with different types of artwork. All about film output and halftone dots. How to determine and dictate the proper halftone frequency, dot angle, dot shape, mesh count and more. Shortcuts in all programs to speed up the work flow. A quick recap of the secrets of proper screen making, ink usage and press setup. How to print a high-end photo realistic print with a hands-on printing exercise and much, much more! This is a hands-on class where you’ll work side-by-side with Scott on both good and bad artwork. You will work through real jobs for both light and dark shirts. You will receive class work files that include everything from high resolution artwork to low quality JPG images that need fixing. You will leave with a number of complete sample jobs on your computer that you can put on screens in your shop and make a print. This class teaches you how to do separations with and without any third party software. But, if you own T-Seps, FastFilms, Ultra Seps, Separation Studio or other similar automated programs that is all the better because they do the “heavy lifting” when doing high-end separations. The key to a great set of seps is knowing how to make the artwork screen print and separation friendly and then knowing how to tweak the seps for the best and brightest print possible. Creating great separations is just part of the process. You have to understand how your screen department can hold all those small dots on screens and you have to have printers in the shop who understand how to not “kill” the print. A portion of this class is about the importance of good screen making and press setup. This workshop takes place in SGIA’s state-of-the-art laboratory located in Fairfax, Virginia (a suburb of Washington, DC). Minimum class size requirements must be met 30 days prior to workshop start date in order to hold workshop. SGIA Registration/Cancellation Policies. Previous articleCatch the ISS Long Beach Show Review with Fresener and Greaves. Next articleHow to Print T-Shirts eBook! FREE!